The Georgia Coastal Management Program has partnered with the Sapelo Island National Estuarine Research Reserve Coastal Training Program, Coca-Cola, and River Network to provide Make-Your-Own Rain Barrel Workshops for residents in coastal Georgia. Participants will learn how to "Live Positively" through Coca-Cola's recycled rain barrel program. 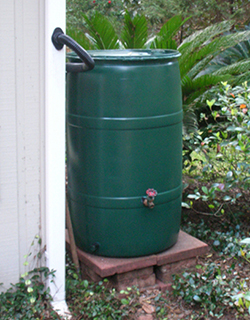 A rain barrel can save most homeowners 2,000 gallons of water each year which can be used for watering gardens, washing cars and other projects around the house. Workshop participants will learn the importance of water conservation and the basics of rain water harvesting. They will also get the chance to construct their own rain barrel to take home with them that day! The inaugural workshop was held at Coastal Resources Division on January 19, 2012. Check back regularly to find out when the next Rain Barrel Workshop is scheduled near you!